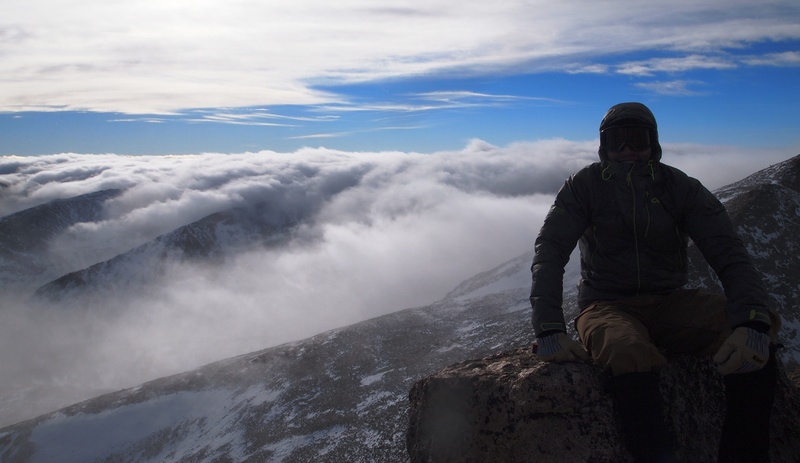 Above the clouds on the summit of Pagoda Mountain in Rocky Mountain National Park. 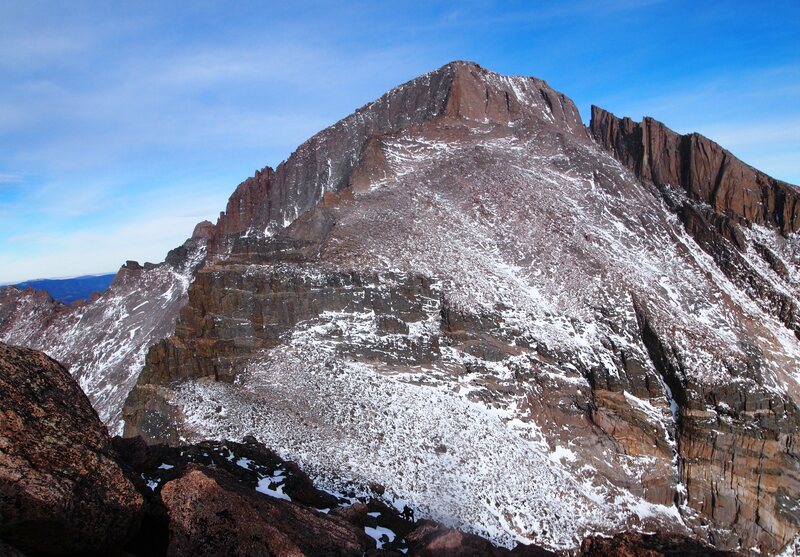 Pagoda Mountain sits at the southern end of Glacier Gorge in between two of Rocky Mountain National Park’s beasts: Longs Peak (14,255 ft.) and Chiefs Head Peak (13,579 ft.). 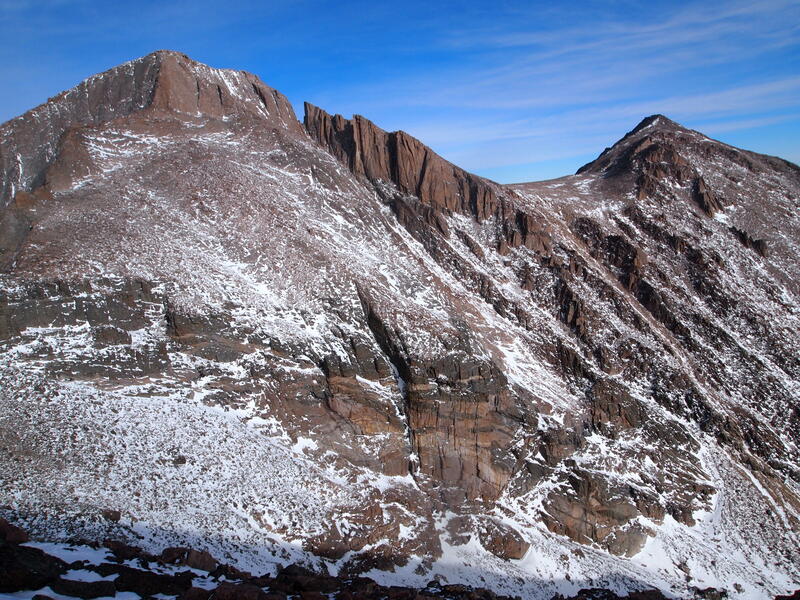 With an elevation of 13,497 ft., Pagoda Mountain is the 7th highest ranked peak in The Park. It’s been said that Pagoda’s summit register (which we unfortunately couldn’t locate) may receive on average about 75 signatures a year, while its neighbor may receive that many visitors in one summer day. Those in attendance on this cold, windy December day: myself, Emily and Brian. 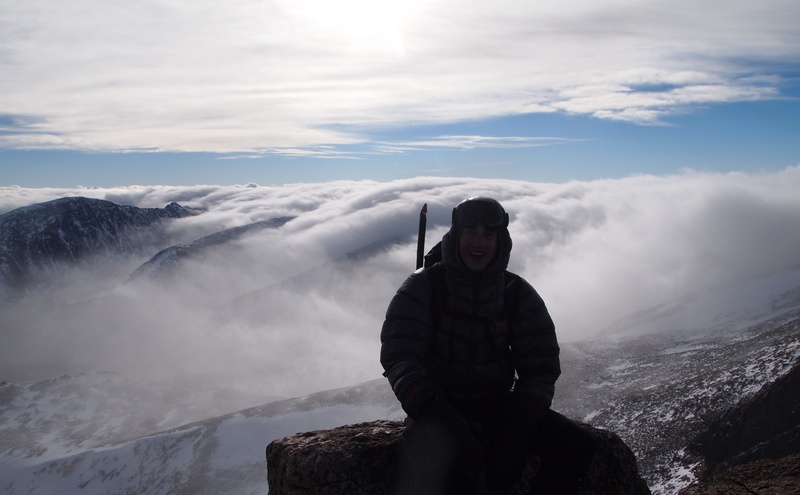 This would be Brian’s 1st 13er (we think…the jury is still out. 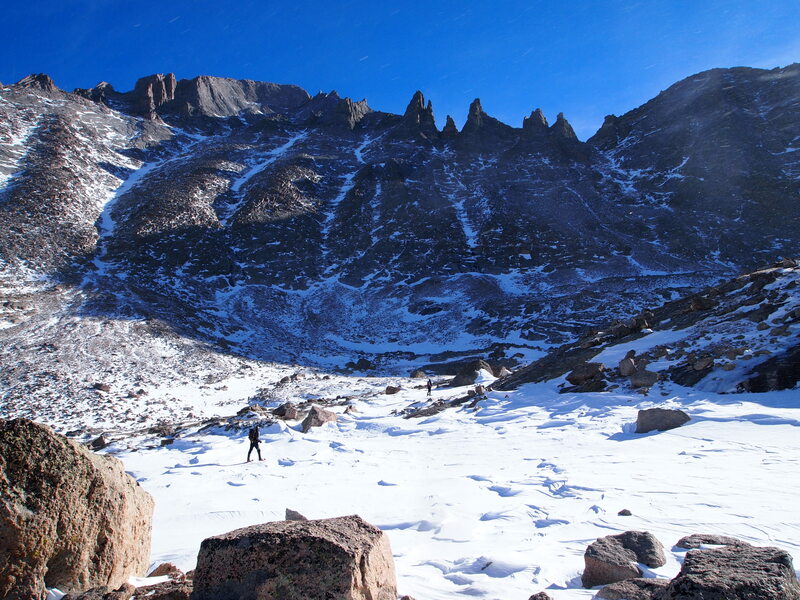 We do know for sure that his 1st and only 14er to date was Quandary…. last month!). The phrase hazing may be an understatement. 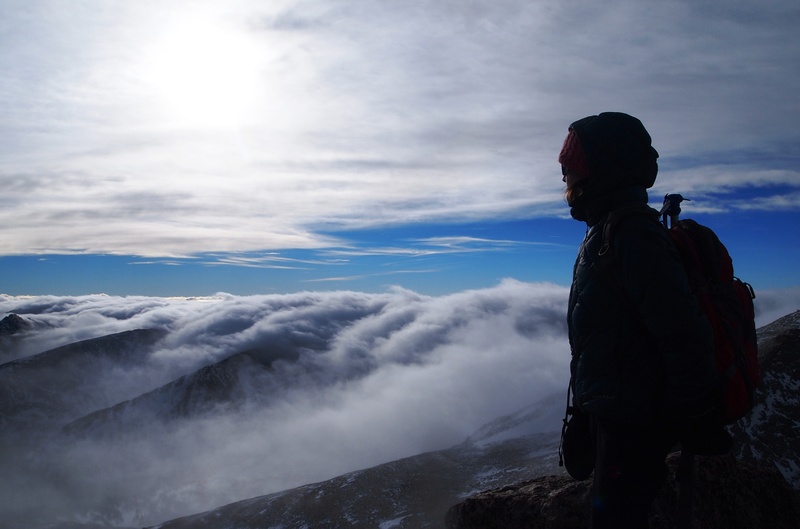 Emily quoted the trip nicely 10+ hours in, and still 4 miles from the jeep in freezing temps, when she said, “I’ve had a lot of epic days out on 14er’s, but this is definitely my 1st epic day on a 13er!” And so the story goes…. 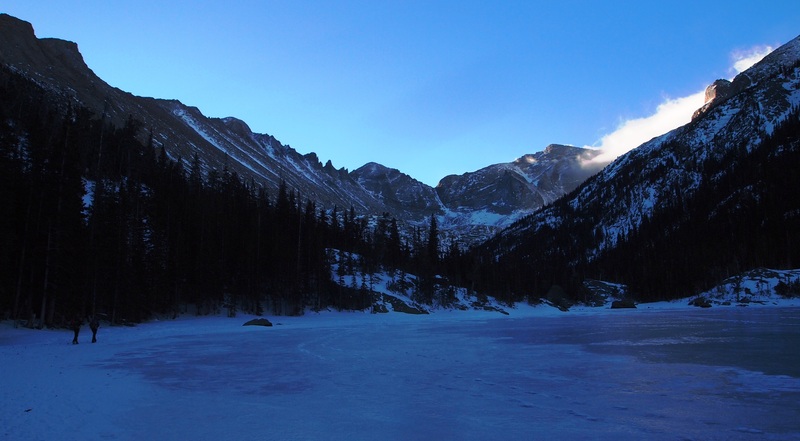 Mountain: Pagoda Mountain – Rocky Mountain National Park – Elevation 13,497 ft.
Elevation Gain: ~ 4,800 ft.
As we round a frozen Mills Lake with some clouds rolling in, the gems of the southern end of Glacier Gorge come into plain view. From left to right: The Keyboard of the Winds, Pagoda Mountain, and Chiefs Head Peak, with The Spearhead looking spectacular in the foreground. 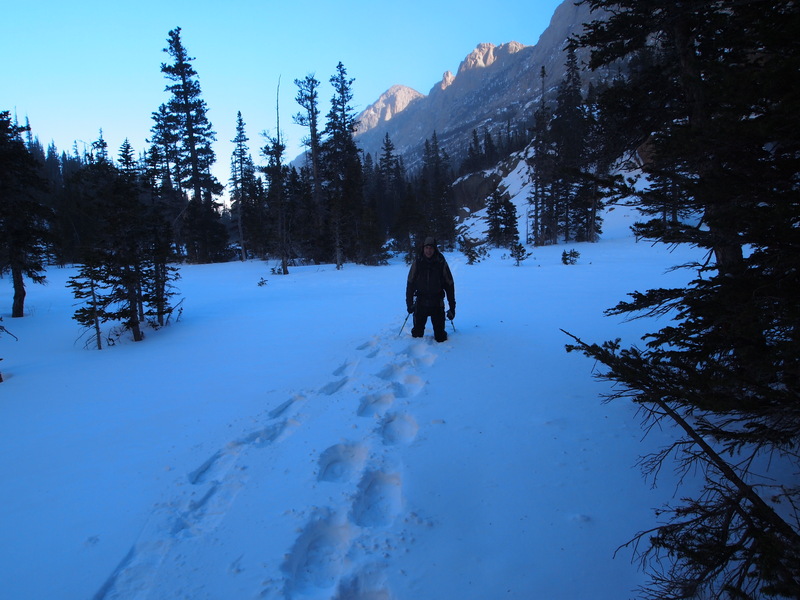 It was here, about half-way between Mills Lake and Black Lake, that we put on our snowshoes. 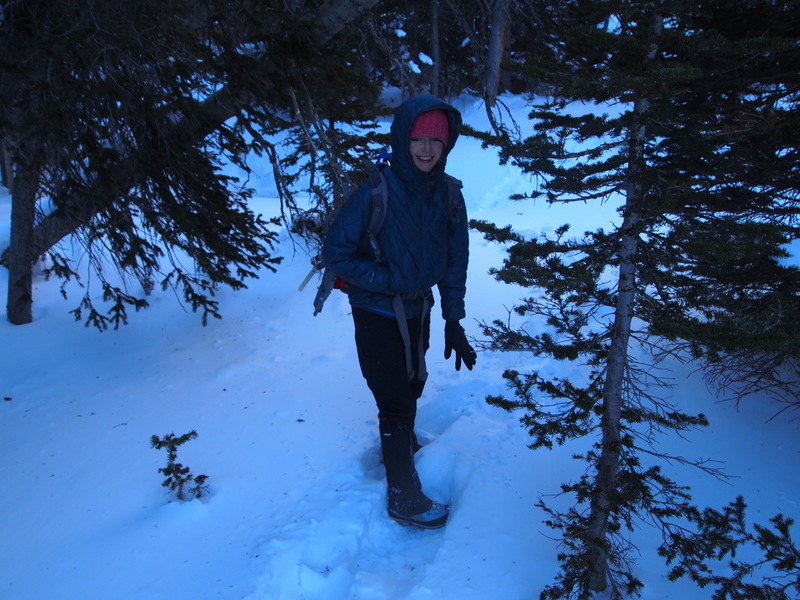 There was a good solid trench all the way to Mills Lake, but beyond the lake, we’d do our own route finding to Black Lake. 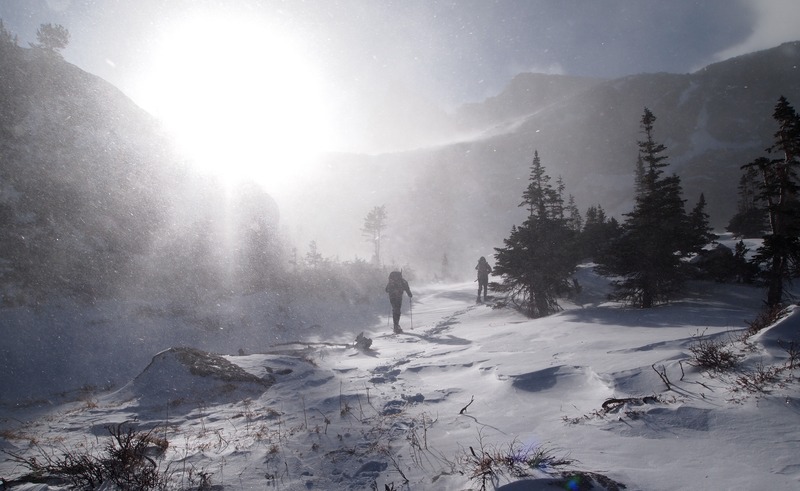 The wind begins to pick up en route to Black Lake. In the shadow of Longs and Company all day, this was one of the few times we’d feel the sun. There’s that wind again. I’m not very good at estimating wind speed, but I’d guess we had gusts as high as 40+ mph at times for sustained stretches until we hit the Pagoda/Keyboard saddle. 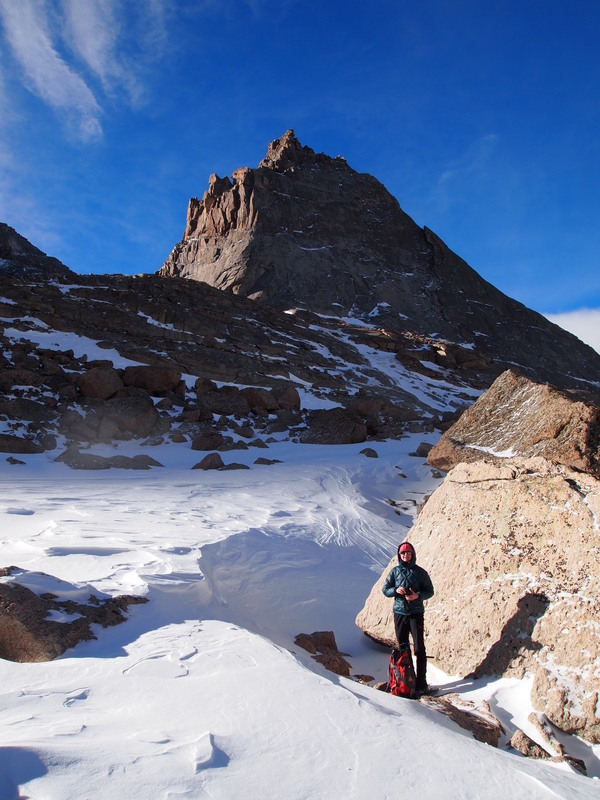 Once at Black Lake, we hunkered down behind some large boulders to rest and refuel. 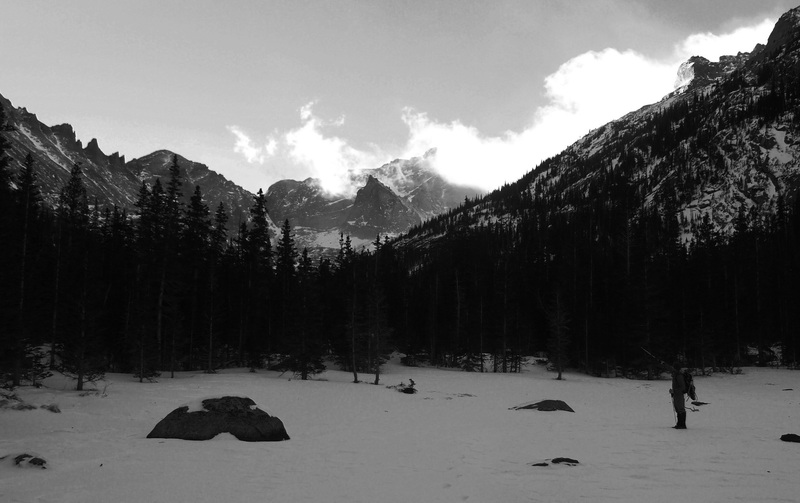 As we thawed out, I popped my head out to get a good look at Black Lake and the route ahead. From here the route takes a sharp left eastward, through a small canyon of sorts, to the upper basin below Pagoda, Chiefs Head and The Spearhead. To our surprise, there were 2 skiers behind us. 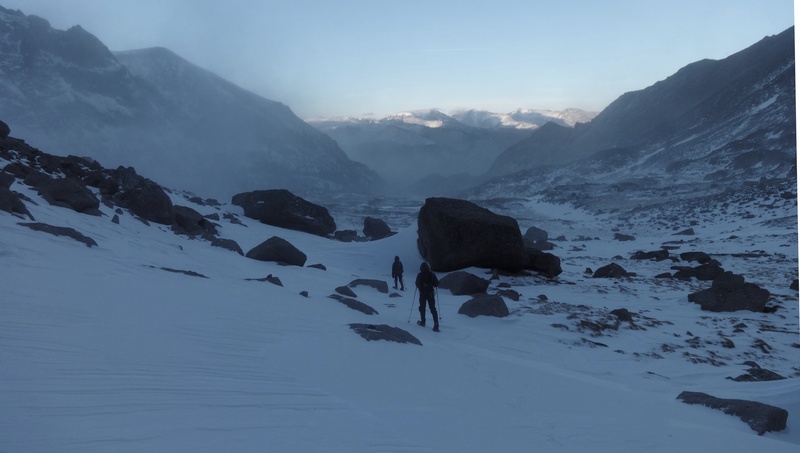 They were on their way to do some ice climbing just beyond Black Lake in an area called the Black Lake slabs. I don’t have any pictures of this area because my hands were frozen as we passed through, but Emily, being an ice climber herself, was in awe of all of the ice surrounding us. 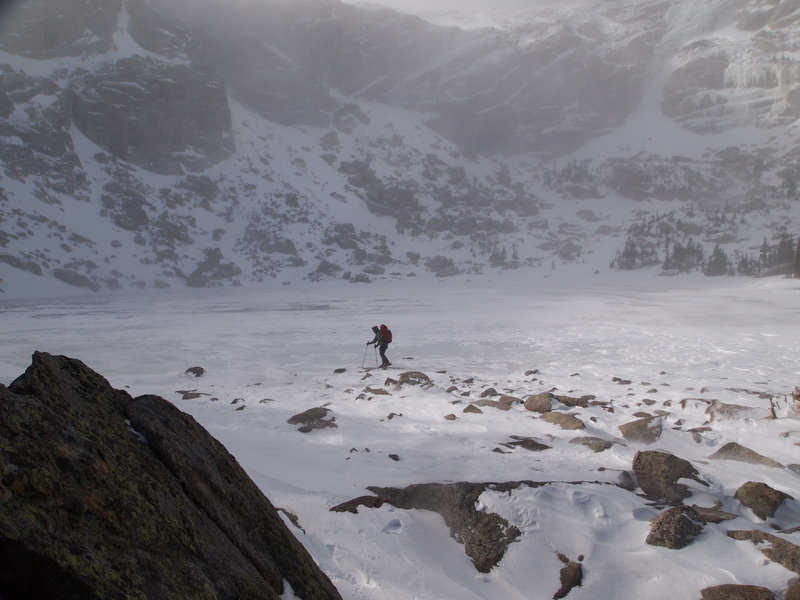 One of the skiers making his way around Black Lake. 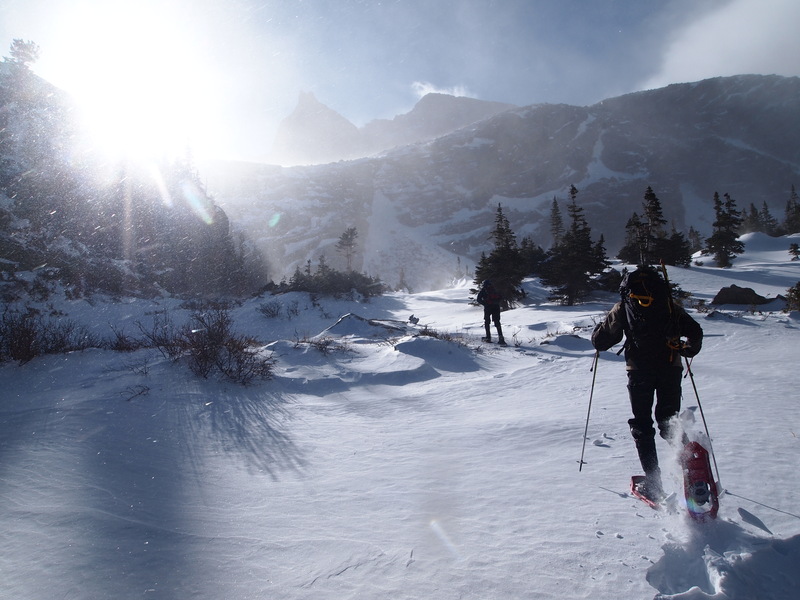 Once past the Black Lake slabs, we made another sharp turn, this time south. From here we followed cairns all the way to Green Lake. Green Lake sits at the base of Pagoda Mountain…. about 2,000 ft below the summit! In the upper basin, just below Green Lake with the Keyboard of the Winds towering over us. Pagoda’s north east ridge can be seen top right. 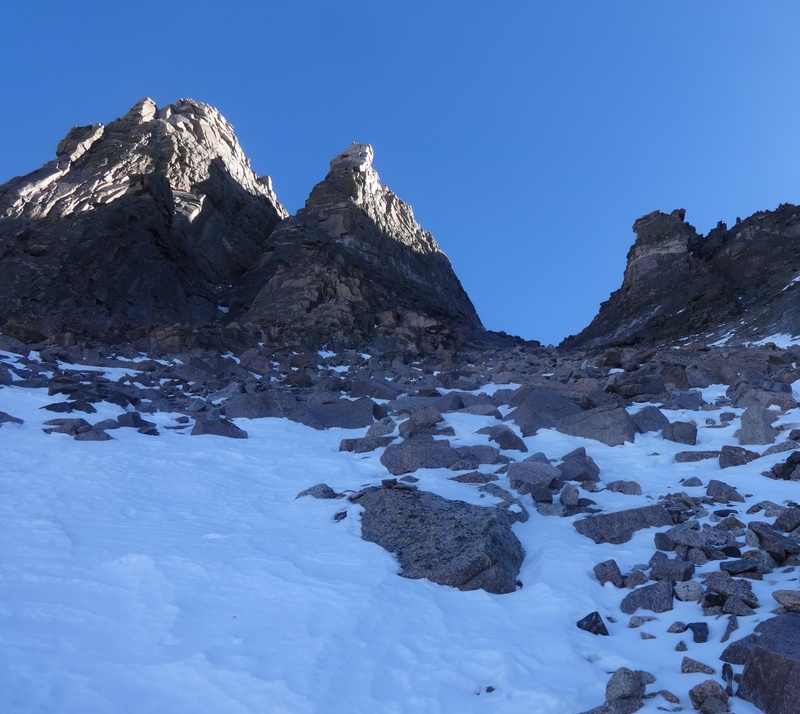 Our route would take us up the gully to the saddle between the southernmost tower on the Keyboard and Pagoda (V notch to the far right). Emily just below Green Lake with The Spearhead hovering in the distance. Eat up, drink up. From here on out, you’re going to need all of your energy and every muscle. 2,000 ft in less than a mile. GO!!! In all honesty, having just gained 24 lbs over Thanksgiving, I was spent about half way up. About half way up… Emily can be seen in the center of this photograph. Brian making his way up. We spread out to avoid any rock fall danger. Green Lake pictured below. Another shot of Brian on his way up. Mills Lake and Jewel Lake can be seen (top center) in the distance below tree line. 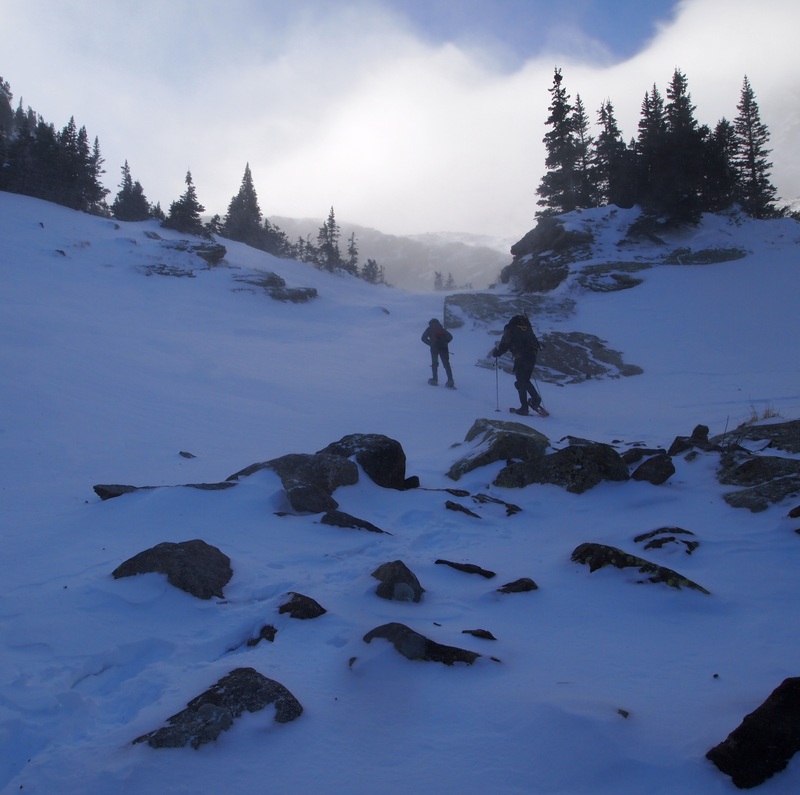 Once we reached the saddle, we finally got the reprieve from the wind we were hoping for. 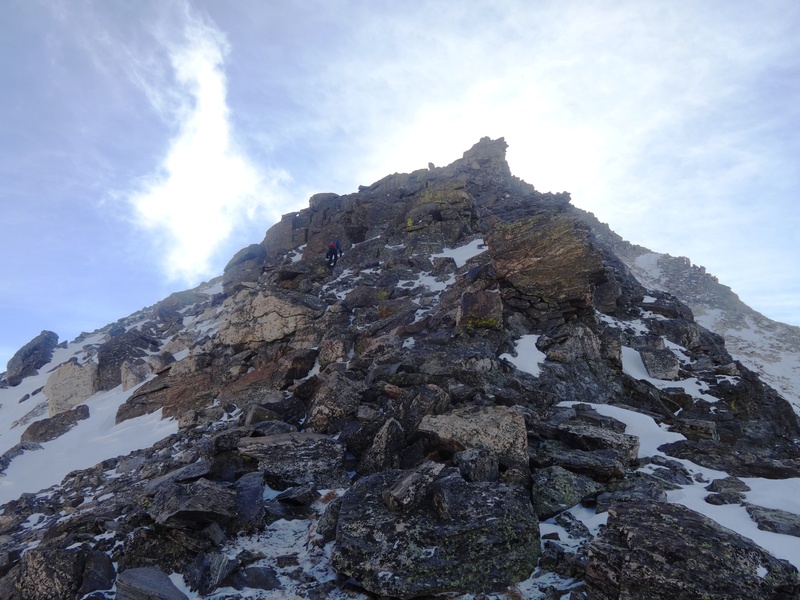 All that remained was a few hundred feet and a class 3 scramble to the the summit on Pagoda’s north east ridge. At this point the views were amazing all around, but it wasn’t until we hit the summit that we realized what we were in for. 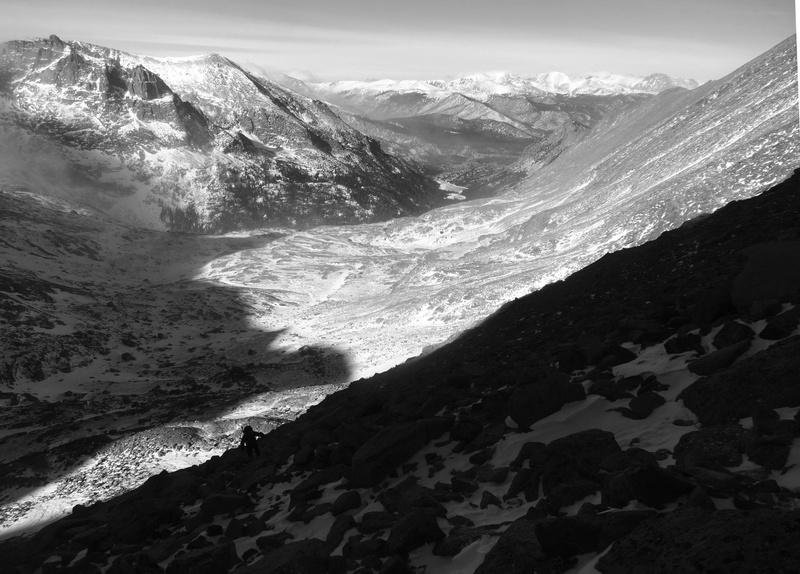 Longs and Meeker from a less seldom seen vantage point on the Pagoda/Keyboard notch-like saddle. Emily scrambling to the summit. Brian making his way up the final scramble (pictured bottom center). 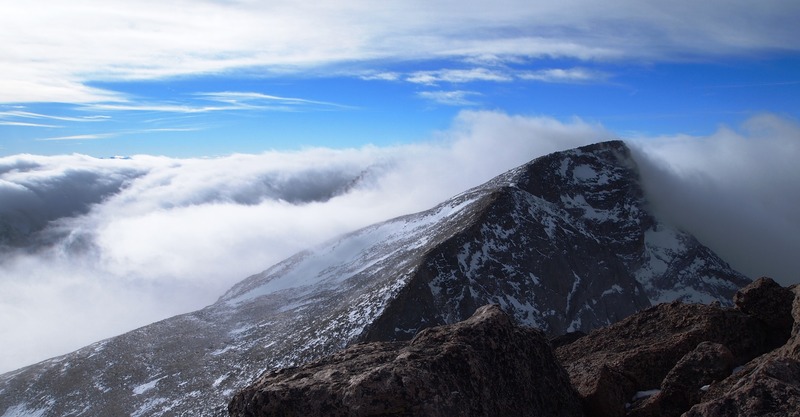 Just below the summit (at approx 2 PM), we were finally able get a glimpse of what was happening in the clouds to our west. 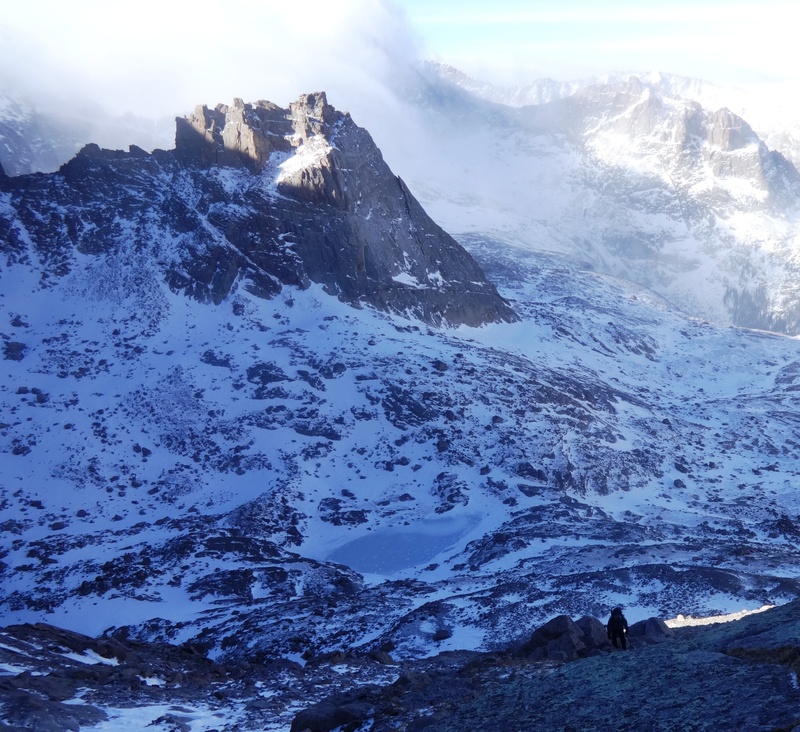 Without a doubt, the most amazing scenery I have ever experienced from any peak to date. 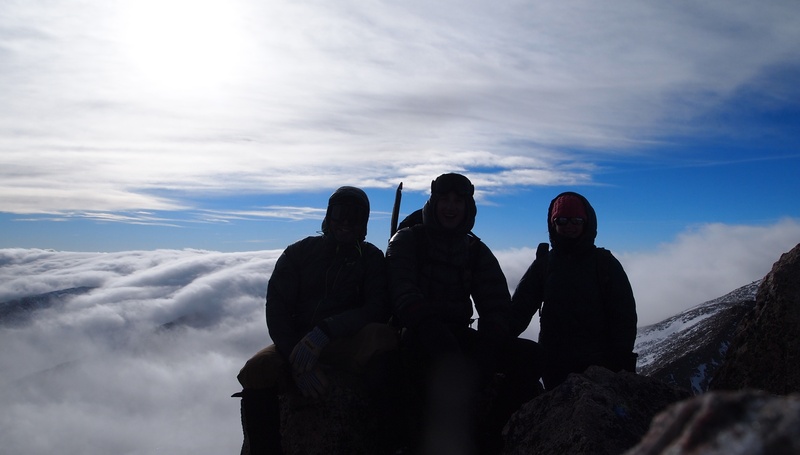 The following are a few of our summit shots. It was truly an incredible day above the clouds. Summit Group Shot (L to R): Dillon, Brian, Emily. The trek home was very long and very cold, but even if we had come back with a few less fingers and/or toes, we would have all agreed, it was well worth it. Brian, Emily, thanks for playing. It was a pleasure to spend the day with you both. Let’s get out there again soon! THE END – Thanks for reading!